Watching the BBC video of “Perfect Day” as it ended another tribute to Lou Reed I was struck by the less obvious artists who appeared in it: Emmylou Harris, Dr John, Robert Cray… did you remember Robert Cray singing a line? I listened to New York whole, top to bottom, as Lou wished. It’s my favourite Reed album, and I remember boring friends in 1989, endlessly making them listen, saying it had the greatest guitar sound ever recorded (the chorus guitar of “Hold On”). It opens with the killer triple-whammy of “Romeo Had Juliette”/“Halloween Parade”/“Dirty Blvd”. Sensational. Best piece of writing from the past few days about him is here. Nothing will replace in your heart the Moondance version of a song Morrison first titled “Into The Misty”, but listen to this tracking session take. Van on intense, focused and dynamic rhythm guitar, possibly John Platania on second guitar, drummer Gary Mallaber and bassist John Klingberg playing off his lead… these guys are in the moment, in the mystic and it’s glorious. As Lou would say, you can’t beat two guitars, bass, drum. 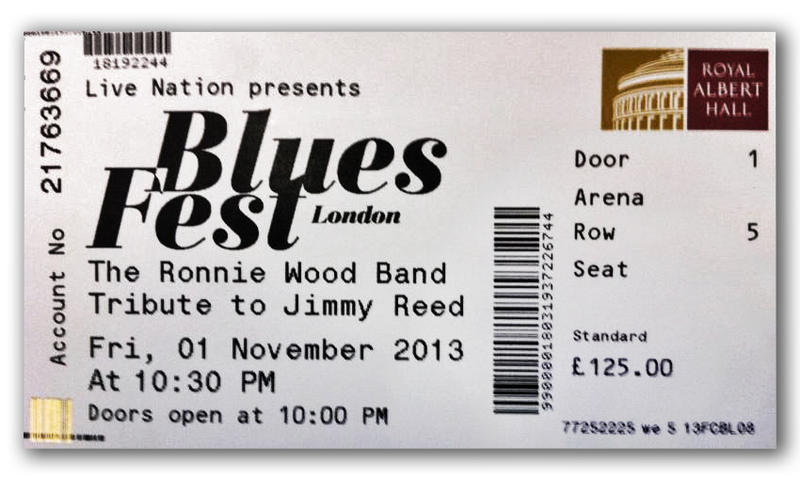 Ronnie Wood Ticket For Sale. Stop Pushing At The Back. Someone included me in a round robin offering this for sale. £125? For Ronnie Wood playing three chords for two hours. I love Jimmy Reed, but there are limits. I saw a Sky Arts tribute to BB King the other day, where a large group of guitarists and singers added very little to B’s show. In the 30 minutes I saw, Ron contributed the least, but was a jocular figure, happy to be there. Mick Hucknell sang, Susan Tedeschi barely got a look in on guitar but sang very nicely. Slash was jarringly inconsistent, sometimes good, sometimes not. B was imperious when he played, which was not a lot of the time, but was always telling, which others weren’t. But the man who was king was humble Derek Trucks, whose mix of slide and fingers pulled off a truly wonderful solo in the sentimental ol’ slowie “Guess Who” and knocked everyone else into a cocked hat.